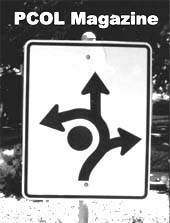 We've changed to make it easier to navigate our site. 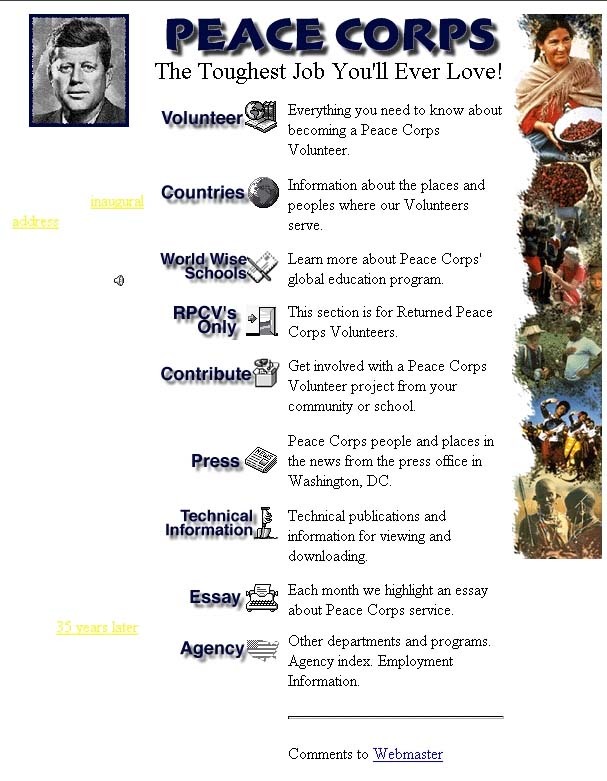 Use the menu to the left to learn about the Peace Corps. The Web has become very diverse. Don't think so? Consider the list of some 140 nominees competing for The 6th Annual Webby Awards. The International Academy of Digital Arts & Sciences Monday announced its short list of the best, brightest and most bizarre rest stops on the Information Superhighway. 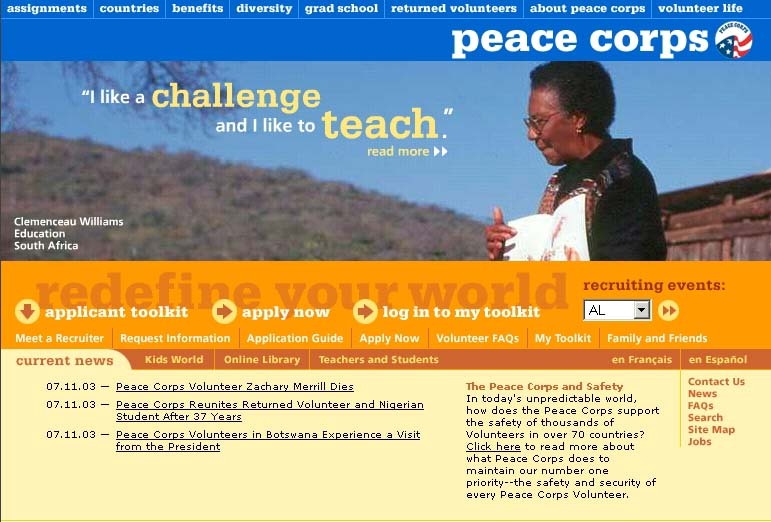 Among the sites being considered for the Internet award: How about the Vatican and Planned Parenthood or the Peace Corps and the U.S. Army? There are some 28 categories, including Activism, Finance, Community, Film, Travel, Personal Web Sites, Sports, Spirituality, and Weird. Nominees in NetArt and Technical Achievement will be announced Monday, May 6. A complete list of nominees is available at their home site. "With more than 500 million people online today, we've reached a stage where the Web is part of the fabric of our lives," said Maya Draisin, the executive director of The International Academy of Digital Arts and Sciences. "The 2002 nominees - both large and small - are setting the standards for the medium and transforming the way we live." 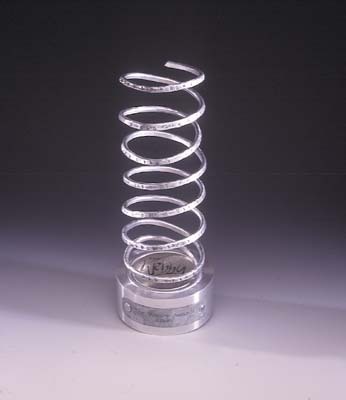 Winners will be announced at The 6th Annual Webby Awards, which will be held on Tuesday, June 18th, 2002 at the California Palace of The Legion of Honor in San Francisco. In keeping with Webby tradition, winners will once again be held to a five-words-or-less acceptance speech. 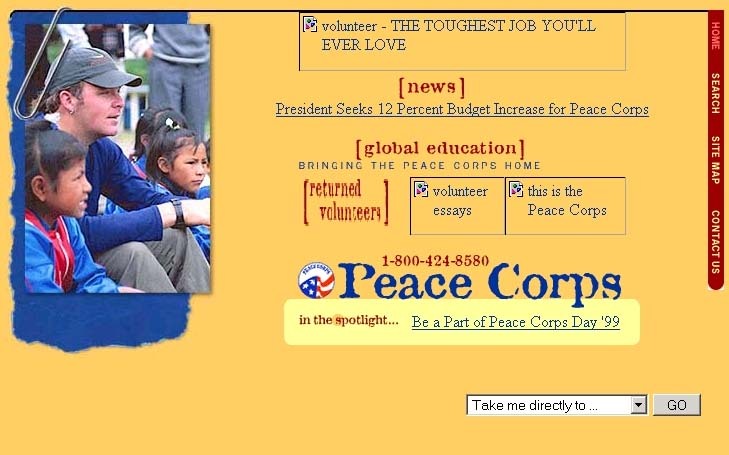 Last year's finest moment: "Bush volunteers, it's that easy," said VolunteerMatch founder Jay Backstrand, who won two Webby's last year. The Sixth Annual Webby Awards also mark the debut of three new awards: The Rising Star Award, which recognizes the fastest-growing site, Top U.S. Site, and Top Global Site. In partnership with Nielsen//Netratings, these awards are determined using their Internet audience rankings for May 2002. As evidence of a growing interest in the Webbys and the Web itself, the Academy received a record number of entries this year, with submissions coming from 36 countries. 2002 international nominees include AllAfrica.com (Mauritius-News), Debkafile (Israel-News), BBC News Online (United Kingdom-News), Freemuse (Denmark-Music), RTE Interactive Radio (Ireland-Radio), and The Vatican (Vatican City-Spirituality). 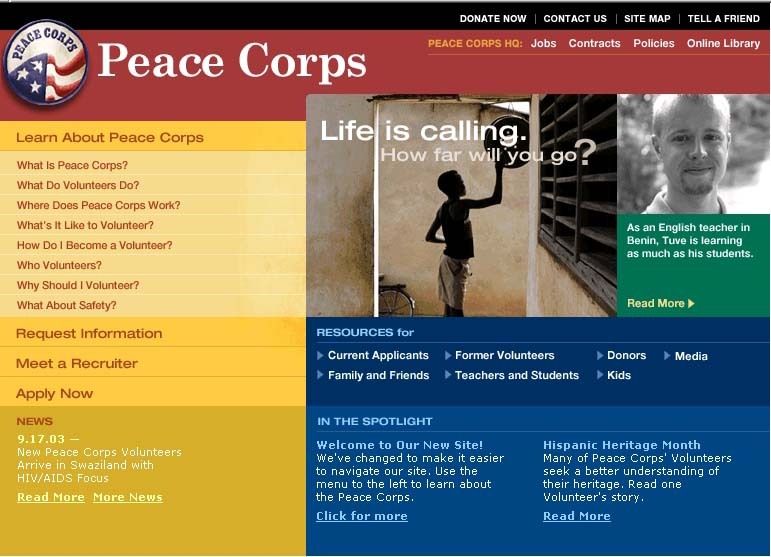 Several sites are also nominated in more than one category including: Idealist.org (Activism and Community); Beliefnet (Community and Spirituality); and Amazon.com (Best Practices and Commerce). BBC-affiliated Web sites are nominated in three categories - News, Radio, and TV. "The 2002 nominees demonstrate that the Web is really getting back to what it does best - connecting, building communities, entertaining, and enhancing everyday life," said Webby Awards founder and director Tiffany Shlain. For the second year in a row, the Academy will present The Best Practices Award, which recognizes a single Web site that serves as a model of excellence. This year's nominees are Google.com (2001 winner), Amazon.com, National Geographic, Peace Corps, and U.S. Army Basic Training. Called by some the "Oscars of the Internet," The Webby Awards is an international honor for Web sites and individual achievement in technology and creativity. The awards are presented by the Academy, a diverse, 350-person organization whose membership includes Francis Ford Coppola, David Bowie, Esther Dyson, Rob Glaser and Julia Child.